Sales concluded Friday for United States Mint commemorative coins in clad, silver and gold. The latest Mint data reflects a buying spike due to all of the last minute purchases, but ending sales figures were nowhere near authorized mintage limits. The US Army silver dollars experienced a combined gain of 2,203 after adding 1,694 in the previous round. The new total hit 163,346 or 32.6% of the maximum mintage allowed by Congress. 119,829 of the coins were proof-quality and 43,517 were uncirculated. For Medal of Honor silver dollars, a larger surge of sales took place. Collectors scooped up 4,935 in all this week, which was more than the 2,731 jump previously. Between their launch on February 25 and their last day of availability on Friday, 157,619 of the silver dollars sold, or 31.5% of their limit. Broken out, 112,850 of those were proofs and 44,769 were uncirculated strikes. Not only did these sales not come close to their authorized mintages, but they are among the lowest in modern day commemoratives. As the nearest example, last year’s commemorative coins struck in silver enjoyed much stronger sales. 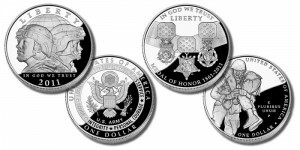 350,000 of the proof and uncirculated 2010 Boy Scouts silver dollars were ordered, while 267,740 of the 2010 American Veterans Disabled for Life silver dollars were sold. On the flip side, as the 2011 mintages are so low, their secondary market values are likely to exceed many earlier commemorative coins in future years. *The United States Mint often tweaks sales for coins after they sold out or went off sale. The above chart will be updated with the latest available figures. To keep track of new silver commemorative sales, also visit this site’s silver coin sales page. In other United States Mint sales news, the America the Beautiful Silver 5 Ounce Bullion Coins also erupted on the sales chart. Both the Vicksburg and the Chickasaw five ounce coins advanced by 1,300 each, while the Olympic bullion climbed by 800. It had been months since the US Mint’s Authorized Purchasers bought so many five ounce coins during the week. Monday, December 19, is the "as of date" for all the United States Mint collector coin sales figures shown above. Monday, December 19, is the "as of date" for the America the Beautiful bullion coin sales. Wednesday, December 21, is the "as of date" for bullion American Silver Eagles. *The sales figures include 469,500 of the 2010-dated Silver Eagle coins sold this year. There was a $10 surcharge for each silver dollar sold, as well as $35 for each $5 gold and $5 per clad half dollar. Surcharge proceeds for U.S. Army commemorative coins will be forwarded to the Army Historical Foundation to support the construction of the National Museum of the United States Army at Fort Belvoir, Virginia. The money raised from Medal of Honor commemorative coins will go towards the Congressional Medal of Honor Foundation to help finance the educational, scholarship and outreach programs of the Foundation. Final audited mintage numbers for any of the commemoratives will not be available until 2012.